LaVerne Ford, age 98, of Glencoe, Minnesota, passed away Tuesday, November 6, 2018, at Glen Fields Living with Care in Glencoe, Minnesota. Mass of Christian Burial will be held Wednesday, November 21, 2018, 11:00 A.M. at Church of St. Pius X in Glencoe, Minnesota, with interment following in the Glencoe Catholic Cemetery in Glencoe, Minnesota. Gathering of Family & Friends will be held Wednesday, November 21, 2018, from 9:00-11:00 A.M., two hours prior the service at the church. LaVerne M. (Stibal) Ford was born March 22, 1920, to Stella (Henry) Stibal and Joseph J. Stibal at St. Luke’s Hospital in St. Paul, Minnesota. She was baptized at St. Luke’s Catholic Church in St. Paul and was confirmed at St. George Catholic Church in Glencoe, Minnesota. The family moved from St. Paul to Glencoe when she was three years old. She attended the Catholic Parochial School for eight grades and then graduated from Glencoe Public High School in 1937. She completed the one-year “Normal Training Course” at Glencoe High School and taught two years in McLeod County rural one-room schools. She earned a two-year teaching certificate at St. Cloud Teachers’ College and taught two years in the New Prague, Minnesota Elementary School. She then graduated from the Dickinson Secretarial School in Minneapolis and started her career in the insurance industry which centered in Minneapolis with the exception of two years in New York City. She continued her education completing University of Minnesota classes and insurance-related classes to earn the Certified Professional Insurance Woman designation. In 1969 she was appointed the first female department manager in her company – nationwide, and in 1970 she was honored as “Minneapolis Insurance Woman of the Year”. Activities included: Insurance Women of Greater Minneapolis, American Business Women’s Association, League of Women Voters, and Women’s Division of the Minneapolis Chamber of Commerce. She retired December 31, 1980 as Audit and Collection Manager of the Minneapolis Division Argonaut Insurance Company. On January 17, 1981, she married John W. Ford at St. George Catholic Church in Glencoe officiated by Reverend James Devorak. Continuing her interest in community service, she was active in the American Legion Auxiliary, Red Cross Bloodmobile, Meals on Wheels, Extension Home Study Groups, Performing Artists Services, Christian Women’s Club and served as Election Judge for the city and school district. She and John were blessed with twenty-four years of retirement living and in January 2005 she moved to an apartment in the independent senior community of Orchard Estates in Glencoe. On February 24, 2016, to the present she was at Glencoe Regional Health Services Long Term Care Unit. She enjoyed reading, craft projects, DVD movies, playing cards and being with family members. 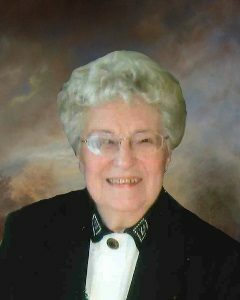 LaVerne passed away peacefully on Tuesday, November 6, 2018, at Glen Fields Living with Care in Glencoe, Minnesota, at the age of 98 years, 7 months and 15 days. Blessed be her memory. LaVerne was preceded in death by her parents; husband, John; brother, Joseph Stibal; sister, Josephine (Ronald) Renick; sisters-in-law, Mary Jane (Robert) Link, Tillie (John) Hettver, Irene (Virgil) Hajicek, Clara Klobe; brother-in-law, LeRoy Donnay. My thoughts and prayers go out to the whole family. So sorry to hear about Laverne’s passing. She was a remarkable woman and will be greatly missed! I was saddened and shocked to learn of LaVerne’s death. I had my usual good visit with her while trimming and fixing her hair on Mon. I very much enjoyed visiting with her the past several years. I offer my deepest condolences. May she have eternal rest. Thank you for thinking of us and your thoughts and prayers. One of my favorite Bible Study attendees at Orchard Estates. Didn’t realize what a prominent, trail blazing life she had! Blessed be her memory (and legacy) indeed! Thoughts and prayers to LaVerne’s family. She was my dads “double cousin”. Thank you, Jackie. LaVerne so enjoyed her visits and calls with your Dad.